One of the numerous blessings of being a Mom is watching your offspring grow into adults. Yes, there are anxious moments and sleepless nights along the way, but then – they get to a point where they are standing on their own two feet, proud and tall, maybe even surprised that they have ‘arrived’. In my mind this is nothing short of miraculous. However, holding your first grandchild in your arms, just an hour after his birth, brings you to your knees as the tears flow…tears of pure joy. “Miraculous” takes on new meaning. This turns out to be the beginning of another chapter, another great adventure in life that is at times difficult to put into words. How can you write what it is like when those little eyes know who you are? What words are there to let others know just how smitten you truly are? That you would move heaven and earth to do anything to just be with that grandchild? This is the part of the story that I would turn to the back of the book to read. 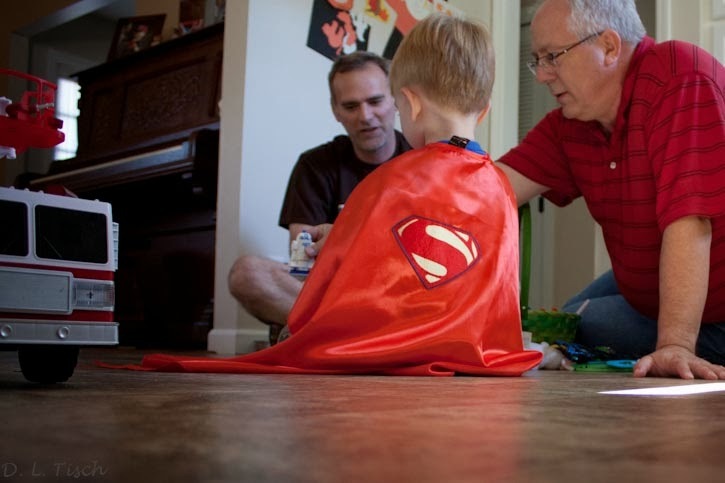 The Three year old likes Superman, runs around the house wearing a blue bunny rabbit mask along with the Superman cape, says “bless you!” when someone sneezes, but also pokes fun at his Grandpa for making funny noises when he blows his nose. He loves games these days, so the Fruit Dominoes that we bought were the perfect gift, and we had to play it several times. We did not mind at all. The story continues. There are at least a couple of Superman capes available for him to wear because superheroes can get into messes, you know. And new miracles will come along repeatedly as we see him grow, adding more candles to that cake year after year. Sharing my words and images today at Vision and Verb. Click the button below and join the conversation! A miracle indeed! Being a grandma is the very best. Happy birthday to the little guy! Aren't we blessed? Loved this Deborah and shared it on Facebook. Absolutely touched my heart. Thank you, Mom, from the bottom of my heart.